AUSTIN, Texas — Nouri Zarrugh gives voice to Libyans repressed by the reign of Muammar Gaddafi in his story “The Leader,” awarded the $50,000 Keene Prize for Literature at The University of Texas at Austin. Zarrugh, a graduate writing student in the James A. Michener Center for Writers, drew inspiration for “The Leader” from his father’s stories about living in Libya. Three finalists each received $17,000. Tanya Ponton, a first-year Michener Center fellow, wrote “Belle Ville,” a story about a Baton Rouge lawyer who hopes to defend a trailer park woman against a wrongful death claim involving her sister. “The story was inspired by my family’s long ancestry in Louisiana Bayou Country, as well as the unique legal challenges that gay couples face,” Ponton said. 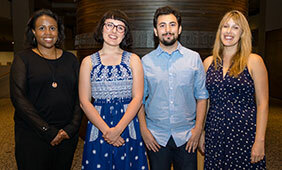 Joanna Garner, a graduate student in Theatre and Dance, wrote “The Orange Garden,” a play that takes place in 1972 Iran, where a young Peace Corps volunteer is quickly swept into a dangerous romance and the growing fire of the Iranian revolution. “A story about the complicated ways we fall in love with people and places, the play spirals together Rumi’s poetry, 1960s rock music, whirling dervishes and the lyricism of the Persian language,” Garner said. Samantha Karas, a first-year poet in the Michener Center, submitted “Defiance, Colorado,” a sequence of poems about a silver mining family that attempts to wrest control from nature and the town’s indigenous people. “I began writing this piece during a road trip through western Colorado, shortly after I’d discovered a stash of Depression-era WPA guides dedicated to regional histories and folklore,” Karas said. “I know that there are so many incredibly talented writers who have come to UT as part of the Michener Center for Writers, the New Writers Project, and the departments of Radio-TV-Film and Theatre & Dance, so to receive this distinction is a bit surreal,” Zarrugh said.